StubHub is 10 years old and the ticketing site is "Celebrating by giving our fans a chance to win one of 10 Ultimate Fan Experiences." 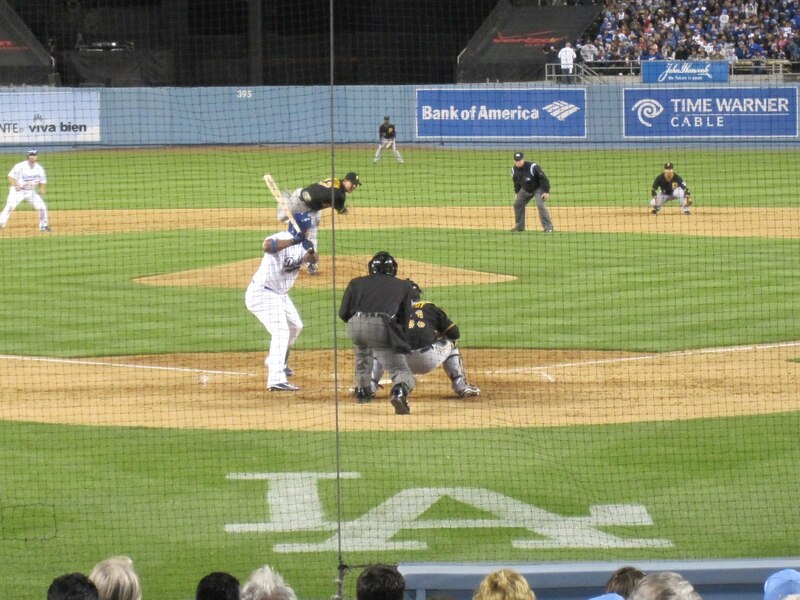 I've used StubHub numerous times in the past and have always been happy with their service and ease of use. There are 3 prizes that are currently up for grabs on the website. Transportation and hotel accommodations provided. Being that I'm not really into college football and that I've already seen the Los Angeles Dodgers play this season, I entered to win my personal dream event. For the dream event, per the StubHub website, you're required to upload a photograph (the “Photograph”) that is relevant to the event in which you indicated you would like to be entered and provide a description in 50 words or less that will “Tell us why you should win the ultimate fan experience” (the “Description”). Limit one Entry per person/email address per Event. Winner to be announced on 9/22. Enter so you have a chance to win a prize, and please wish me luck! If you're not following your favorite athletes on Twitter, you're a fool. 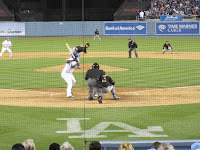 In this day and age, celebrities and athletes use Twitter to connect with their fans. As opposed to having thousands of "friends" in their business, it's easier for them to put out their own messages in tweets. Everything from ticket give-aways, autographed pictures, jerseys, etc. is up for grabs for the lucky trivia winners or quick responders. Larry Fitzgerald has contests for his fans to win autographed items. Chad Ochocinco will tell you when and where he's having lunch. Serena Williams has tweeted that it may not have been the smartest move on her part to go through an airport carrying a tennis racquet, if she wanted to go unnoticed. Earlier today (i.e. and 25 minutes ago) I saw the following tweet from THE_REAL_SHAQ, "send me links 2 ur fav dance videos n I will give @celtics home opener tix & jersey to my fav 1. must include #shaqvs". 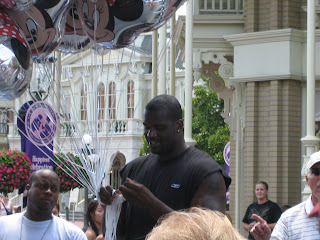 I've seen Shaq at Disney World before and he is just one of the many fun-loving and humorous people (i.e. athletes, entertainers, writers, friends) who I follow. His tweets make me laugh. Get in on the action, create your own network, and tweet people. What are you waiting for?!?! To get you started, here's a URL for a site that provides a directory of Twitter users: http://twitter-athletes.com/index.cfm. From what I can tell they verify the accounts, but of course use your common sense. As a bonus (i.e. 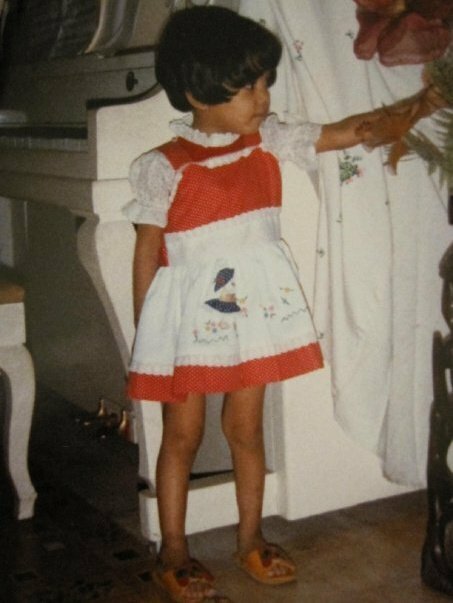 since Justin Bieber is on Shaq Vs tonight, here's a picture for you of LIL WIRK, when she was a wee-little girl. Notice the "Bieber" haircut, before the Bieber fever even existed! NBA Action ~ Remember 1-800-NBA-DAD? It's a slow news day and I've been thinking (read: eagerly anticipating) the start of the NBA season. Earlier, I noticed that Lithuania beat Spain for the first time since 2003. Lietuva was able to overcome an 18 point deficit and win in today's 2010 FIBA World Championship action from Turkey. While there's nothing to report (i.e. I refuse to go into any depth in acknowledging that Chris Bosh is engaged and that LeBron James is probably still taking names), I figured we could flashback to a skit I saw back on the Chris Rock show. The skit was 1-800-NBA-DAD. Featured are Wanda Sykes and Chris Rock. It's hilarious. Enjoy! Want to laugh some more? Check out the following Facebook group: Shawn Kemp is My Dad. Read the info tab and chuckle. FYI ~ The group has 283 members as of today. **** Disclaimer: I actually knew Shawn and his family years ago when he played in Cleveland. I enjoyed my time with them. However, I have to admit, the narrative for this group is funny. As someone who watched Manny Ramirez when he was with the Los Angeles Dodgers once and numerous times while he was with the Cleveland Indians, I look forward to him joining former Tribe teammate, Omar Vizquel, on the Chicago White Sox on Tuesday. **** If only Manny could've picked up a couple of weeks ago, when the White Sox were "in town" so I could've seen more of a Tribe reunion (i.e. with Jim Thome on the field for the Minnesota Twins). Question: Why does Cleveland appear to be the farm team for every major sport? Regardless, here's my prediction: The Minnesota Twins maintain their spot on top of the AL Central. I enjoy watching Dancing With the Stars. In previous seasons, there's usually been someone that I've rooted for in the competition. I caught myself rooting for Jason Taylor (i.e. a fellow University of Akron Alumnus, former Miami Dolphin, and current New York Jet) because he's ridiculously handsome and we went to college together. Most recently I caught myself cheering for Pamela Anderson because she's "likable" and seems genuine. Actually, right now I'm watching "Kate Plus 8" and I'm remembering the terrible performances of Kate Gosselin. **** Incidentally, can someone PLEASE give me $5 every time Kate says the word paparazzi?!?!! Alas, I digress. I just noticed the current line-up/cast for the upcoming DWTS season and let's just say I'm not impressed with the list of people I saw. Granted, the season hasn't started yet. However, there is no POSITIVE visceral reaction that I feel (i.e. that would really compel me to watch the show) when any of the following names are mentioned: Brandy, Jennifer Grey, Margaret Cho, Audrina Patridge, Florence Henderson, Bristol Palin, Michael Bolton, Mike “The Situation” Sorrentino, David Hasselhoff, Kurt Warner, Kyle Massey, and Rick Fox. OK - I may have spoken too soon. Former Los Angeles Laker, Rick Fox, is attractive and I've seen him most recently in Las Vegas during NBA Summer League. However, I don't know how compelling he'll be on the dance floor. This is going to be a rough season with such a lame cast... I predict terrible ratings. For those of you that stuck with this post, here is the footage of Pamela Anderson dancing the Rumba. It's hot... If you haven't seen it ~ you're welcome. Roger Clemens plead not guilty today to perjury charges this morning in Washington D.C. If you ask me, this has been a long time coming. My 2 cents: if Marion Jones can go to jail, so can Roger Clemens. I think what bothers me most about Roger Clemens is that he seems smug and unapologetic. Other athletes that have asked for forgiveness and admitted their mistakes have been able to move on ~ but Roger Clemens has let his bravado speak for him. At issue is the testimony Clemens provided Congress in 2008. Table games are still a novelty for the people in the DC/VA/MD area and being that I like to play craps I was curious to see what Charles Town, WV had to offer. 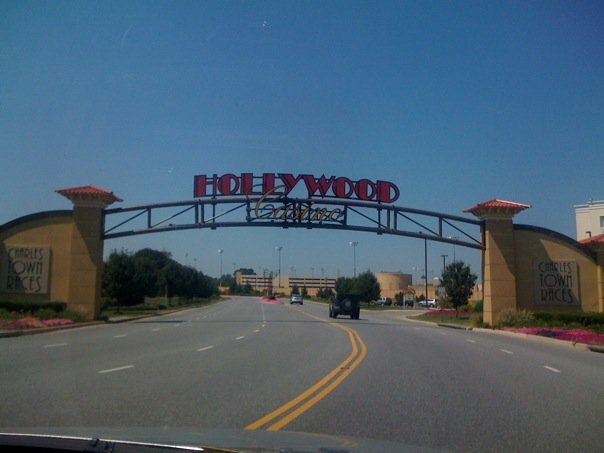 There's a Hollywood Casino in Charles Town. I'm actually familiar with Hollywood Casino since there's one in Indiana that I've visited previously. Picture a Regal Cinemas or movie multiplex sans movies theater but add in the lights and sounds of slots machines and now table games. 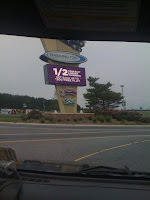 I'd recently visited a casino in Harrington, DE. 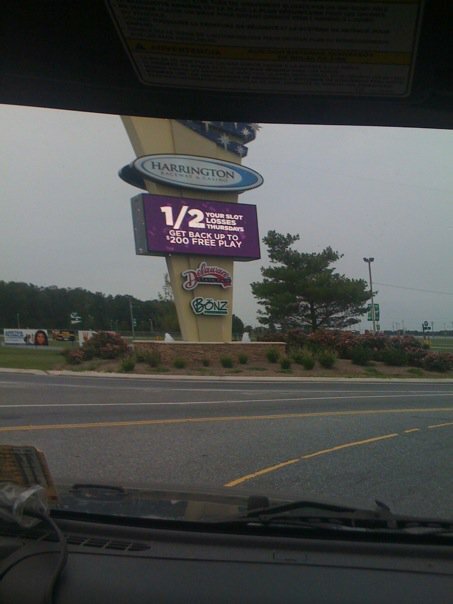 Here is the URL: http://www.harringtonraceway.com/ for Harrington Raceway & Casino. This particular casino only had 1 craps table and if I remember correctly, the table minimum was $15. That casino offered 3X, 4X, and 5X odds. I wasn't particularly fond of my experience, but at least I left even. With only one craps table it's either hot or not and there are no other tables to jump to when the dice are ice cold. I'm not exactly the most mobile person, but I do like having options. Upon arrival to Hollywood Casino Pun and I bee-lined for the table games. 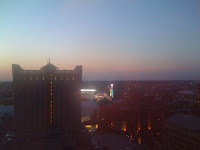 After hearing horror stories about the high table minimums, we were pleased to see that the casino offered 4 craps tables and two each with minimums of $25 and $10. Three of the 4 tables were crowded and the $10 table I wanted to play appeared to be at capacity. When I approached the table to further investigate who had chips in their rack and who was there just wasting space, I noticed a guy about my age and height just standing there. He was leaning against the table and following the action, but wasn't betting. I made eye contact with the dealer and asked if the space was open and he nodded. Then I tapped the guy who had no chips in his rack and asked if he was playing. "I'm learning," was his reply. I told him I wanted to play and asked him to move back. He replied by pointing to another table (i.e. a half empty $25 table) and telling me that I could go play over there. I informed him that I didn't want to play the $25 table, and that I wanted to play where he was standing. The man to his right could see that the guy wasn't moving and politely moved over so I could get in. Within 5 rolls of the dice, I'd boxed the kid out, and he was standing behind me. **** Here's your first lesson: If you're not playing, you need to move so someone else can gamble. This rule is for slots and all table games. You can learn online, by reading a book, or standing behind someone. **** Here's your second lesson: I'll approach you politely and tell you what I want, but if you don't listen, I'm not afraid to tell you how it is. Very little scares me, when I know I'm in the "right". When I got to the table it was about 1PM. I went ahead and cashed in my $20s. I don't like $20s. I prefer $100s. With $180 in my rack, I was in the game at the $10 table. The first thing I noticed when I got to the table was that the odds offered were only 2X. I've played many casinos and I've actually never seen 2X odds offered. I'm used to 3X, 4X, and 5X odds. I've seen 10X odds and higher - but let's face it, I get cheap with my cash and I will never put 10X odds behind my pass line bet. I don't care how hot the shooter is ~ 10X odds is a mental hurdle I don't want to jump. I was chatting this over with my dad earlier today and he thought that was funny when I mentioned it. Whatever. I just can't do it. At the craps table I noticed that no one could make their points. Awesome. I'm not a "don't pass" person, so I just picked up and left. I headed over to the roulette table, and Pun hit the slots. Roulette. Simple game, right? Well I guess to some, not really. There was a young couple sitting at the $15 min table. Here are two examples of the conversations that I overheard. Girl: Are there more even numbers than odd numbers? **** I learned today from my friend Sherry that 0 is actually an even number. Regardless, if you bet "even", you're still not going to get paid if 0 hits. Girl: If I bet this 1/3 group of numbers what do I get? **** Seriously?!?! There are only 36 numbers covered by 1/3s... 1/3 of 36 = 12. The question was raised and I literally counted the numbers in the 3rd in my head, because I couldn't believe that such a basic question was being asked. After getting bored with roulette and Pun wanted a break from slots we hit the buffet. I like buffets. I'm not ashamed to admit it. 2 buffets cost about $40. There's nothing special on the buffet, but my expectations were reasonable. I wasn't expecting the spread at the Bellagio. There were no crab legs and no cocktail shrimp, but there was fried shrimp and a variety of other choices. After eating Pun ran into some guys he knew and I went back to the craps table. I made $100. It doesn't sound like much, but you try making any real money with such low odds offered. One thing I don't enjoy about being one of the only (i.e if not the only) girl at the craps table is that there's always a guy who thinks he knows how to play better than me. "Better" is a subjective term. Just because I don't spread my bets and place numbers doesn't mean I don't know how to. In fact, I usually don't because I've been standing at the table and I know that it's cold so I don't feel like chasing my money and throwing it out there. At about 6PM, Pun and I decided it was over. There really was nothing else I wanted to see. Moral of the story: Just drive to Atlantic City or fly to Las Vegas. I'm ready for some regular season NFL action NOW!!!! 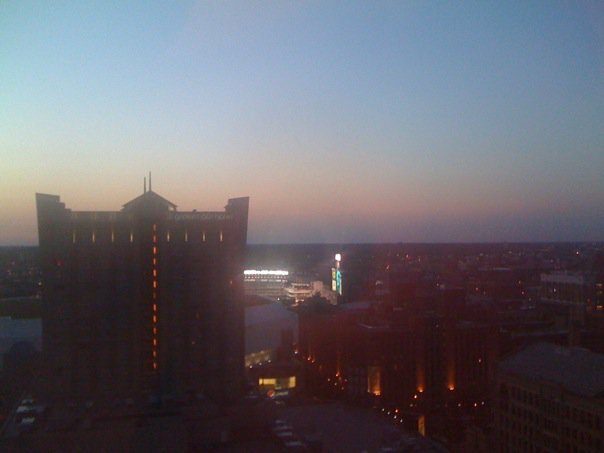 So I'm in Minneapolis and watching the Twins game from my room. Actually, I really don't care about this game. I'm sure it's a good one and I enjoy watching the Chicago White Sox and Minnesota Twins, but I feel like I've seen this match-up numerous times. In fact, if I took the time to add up the posts, I'd be willing to bet that I've seen this match-up at least two times already. Regardless, if there are fireworks, I'll look out the window... The fans have been quiet, so I've been planning the next steps for this blog and my impending time off (i.e. VACATION). **** Update: Someone just hit a home run! There are fireworks! **** Another Update: More fireworks! Twins defeat the White Sox in extra innings, 7-6. 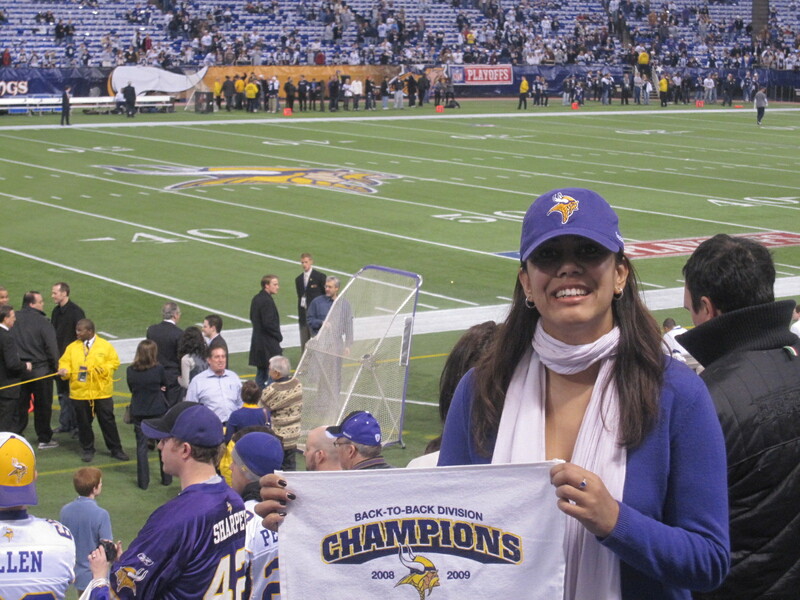 Since Brett Favre boarded a plane to come up North (i.e. coincidentally to Minneapolis, where I am) I've decided that I too should work on finding my "blog voice" again and start strategizing my own football schedule. There are still some great stadiums that I need to hit before I die, so why not use my vacation to tackle Week 1 as thoroughly as only THE WIRK can?!?! The schedule is aggressive, just like me, and hopefully (i.e. with a little help from my friends) things will all fall into place. If it all works out, I can knock off three new venues easily. In addition, I have a some trips, concerts, comedy shows, and some other stuff coming up so dont' worry - this blog should pick up soon! I don't like to telegraph all my plays on here for obvious reasons - but good things are on the way. If you're not familiar with comedian, Aziz Ansari, you have probably been living without power and therefore have bigger fish to fry... Regardless, he is currently traveling and performing his Dangerously Delicious tour. I just noticed that he's added additional last minute surprise standup gigs in Cleveland THIS Saturday in Cleveland, Ohio at the Cleveland Improv. The show times Saturday, 8/21/2010 are at 8PM (i.e. dinner available) and 10:15PM. Tickets are $25. For tickets to the Cleveland date use the following link or you can copy and paste the following URL into your browser window: http://www.clevelandimprov.com/comicbio.aspx?comicid=af8695c3-dc82-4f6d-a406-f7bdb4b2fa9b&locationid=751c5ad7-fc92-4d78-a0ef-b7942a2d898a. Can't wait to see him DC on September 17th. Hey, Akron and Canton ~ This is your weekend! All anyone can talk about today is Brett Favre and his "This is it" text. BFD. According to an ESPN article, Favre has sent text messages to teammates saying, "This is it," league sources told ESPN NFL Insider Adam Schefter. So what? He didn't text "I'm retiring." Maybe he meant, "This is it (i.e. the last year)." Maybe he was recommending the Michael Jackson movie to his teammates. Who knows. Why are people are so jumpy?!?! Until the man says he's retiring and actually misses a game, who cares? Incidentally, I'm currently in Minneapolis and people are awfully quiet around here. I did notice that Macy's moved the Favre Minnesota Vikings jersey's closer to the front of its fan memorabilia section (i.e. to the point where it looks strange, surrounded by the Twins gear). 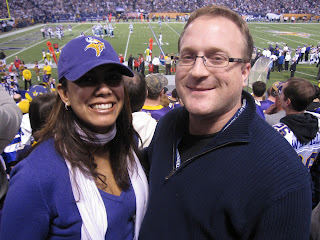 Regardless, I got a call from my friend, The Rick, today who said we may have witnessed Favre's last victory in the NFL. Oh well. Guess we'll find out for sure... Eventually. 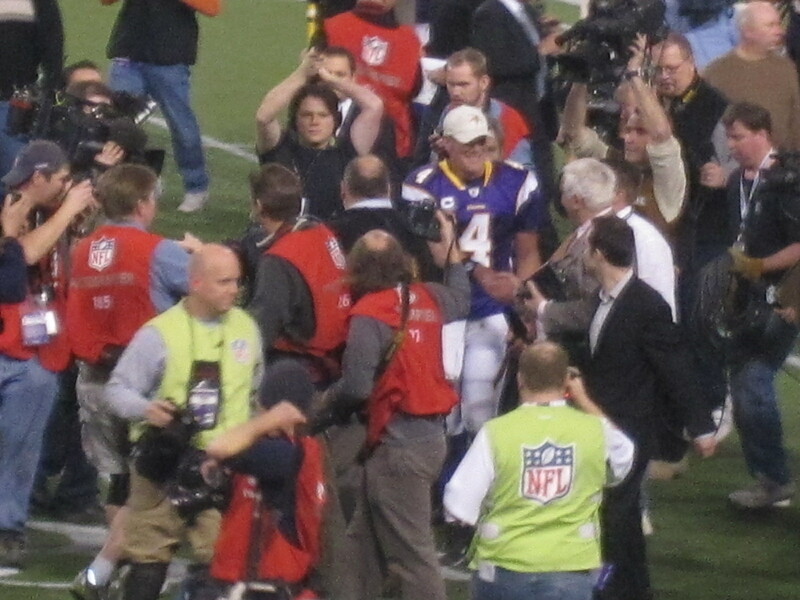 Favre walks off the field, Vikings won! Get your jersey while you can. I was born an Ohioan, but I grew up an old school Lakers fan. However, as I moved towards NE Ohio, I watched more and more Cleveland Cavaliers games and became acclimated to their .400-.500 brand of basketball. I used to see Mike Fratello in Little Italy. I used to catch Jim Chones at the Fairlawn T.G.I. Fridays. I would go to Richfield Coliseum to see Magic Johnson, Dominique Wilkins, and Patrick Ewing. 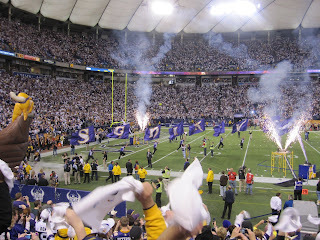 I'd always be over towards the visiting team tunnel. I was young, and didn't really appreciate the people and the heart and talent that the Cavs had until 1998. It was 1996 when I heard the name "Zydrunas Ilgauskas" for the first time. In 1996, he was Cleveland's 20th pick. In 1998, he became my #1 pick. I know Zydrunas' love for the Cleveland Cavaliers runs deep. His love of basketball is immeasurable. The man would be lost without it in his life. I can't even imagine how he's going to feel in a Miami Heat jersey... I do know that he is nothing but professional in his commitment to the game and his career. The most offensive thing you can do to him is question his heart. I'm not surprised by the class in his full-page newspaper ad (i.e. seen below from the Cleveland Plain Dealer). I'm proud.